Dave Seaman is one of the original movers and shakers of the UK house movement, and with his new Selador Recordings label releasing new music and Dave also releasing music on the likes of Noir, Suara, Hive Audio, Tulipa and Sullivan Room, 2015 is shaping up to be decent year. 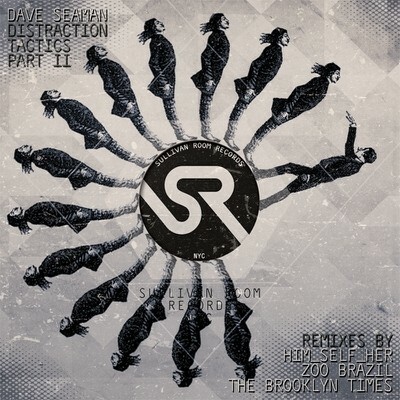 Already a road-tested, Dave ‘Distraction Tactics’ is another good release. Dave’s knowledge of working a dancefloor shines through and with initial support from Monika Kruse, Stacey Pullen, Aidan Lavelle, Joseph Capriati and many more DJs of note, this should do well. Apart from Dave’s Original Mix, there’s a fine selection of remixes on offer here too. Him_Self_Her inject some of their distinctive “house music with feeling” attitude into the proceedings with a remix that joins the dots between deep grooves and driving tech, right through to disco enhanced techno. Meanwhile Swedish duo Zoo Brazil serve up a powerful tech-house groover that should be a good addition to any playlist for this summer season. Sullivan Room’s own The Brooklyn Times give the track a darker edge with a heavier groove and sinister synths, and Meandisco rounds things off with a handy DJ tool to layer over beats or to use as an intro.